The pioneer of luxury trains in India, Palace on Wheels like its name is a royal abode of Kings and Queens on rail. The lavish train travels through the royal landscape of Rajasthan for a journey of 7 days and like its tagline ‘A week in wonderland’, it offers one of the best experiences of luxury train traveling. Extravagance in its essence, the Palace on Wheels is not just a train but an experience of India’s history, heritage and culture in a nutshell. The train is ornately decorated in the riches of the erstwhile royalty of Rajputana. The state-of –the-art amenities, food, sightseeing and most importantly gracious hospitality, makes your travel truly unforgettable. From welcome by caparisoned elephants, visit to royal forts, places and viewing the magnificent wonder of the world’ Taj Mahal’, prepare to be indulged in memories of a lifetime. The Palace on Wheels made its inaugural journey on 26 January 1982 powered by the traditional steam engine. It began the era of luxury train traveling in India. The train also promoted the royal Rajputana kingdoms with Rajasthan Tourism and Indian culture on a global scale. 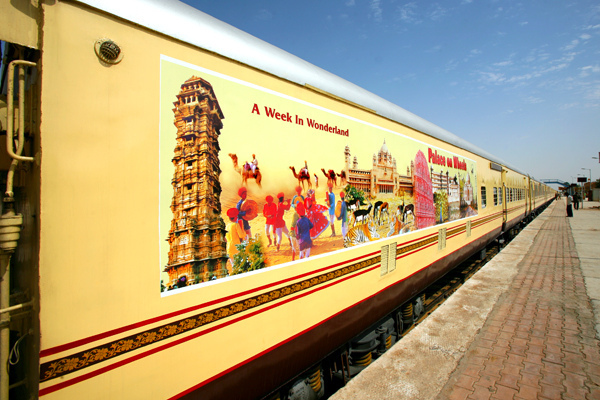 The Palace on Wheels train is not just a means of traveling from one place to another, it offers a unique way of vacations. The train is meant to offer delights of traveling, royal luxuries while exploring the incredible charm of Rajasthan and Agra. The train begins its journey from Delhi, proceeding for cities of Jaipur, Sawai Madhopur, Chittorgarh, Udaipur, Jaisalmer, Jodhpur, Bharatpur and Agra. The entire train ride has all the elements of memorable holidays in India. Enjoy the sights of magnificent architecture in form of forts, palaces and even the ‘wonder of the world’ Taj Mahal. The rich heritage of Rajputs, Mughals and other aspects of Indian culture can be explored in true royal style. Embark for an exploration of wildlife at Ranthambore National Park and Bharatpur Bird Sanctuary. The rich legacy of royalty in India is recreated by Palace of Wheels in not just its journey but also in the coaches. Each of these ornate coaches are named after the princely states of Rajasthan. The lavish traveling saloons were used by erstwhile Kings, Queens and other royals were refurbished with modern amenities for the comfort of guests from all over the world. Moreover the touch of traditional hospitality by the uniformed Khidmatgars make each guest feel like esteemed royalty in their own way. The luxury train of India, Palace on Wheels proves its worth. Guests have the comfort of a master bedroom suite, lounge, delicious food, and amiable service of Khidmatgar throughout the day. In addition, the luxuries also comprise of rejuvenation. Various spa therapies are also available on board, that include therapies like Ayurveda, Orient signature, Thai aromatic, stone therapy, provided by trained masseurs and experts. Named among the the finest luxury trains in India, Palace on Wheels is equipped with all kinds of modern facilities. Onboard the train, guest have the amenities of attached bathroom, air-conditioning, satellite TV, Wi-Fi connectivity, dressing or writing table, etc. In addition, the train boats of two well-furnished on-board restaurants Maharaja and Maharani offering a palate of international and Indian dishes, a well-stocked bar with wine and liquor, gymnasium, full-fledged library, etc. The pioneer of luxury train traveling in India, Palace on Wheels has a number of accolades to its name. It ranks as one of the ten most luxurious train journeys in the world, appreciated by various TV channels like BBC, National Geographic, Discovery channel, MTV, ZEE TV, and more in their shows. It has also been honored with the PATA Award in 1987 and voted as the 4th best luxurious train in the world and best in Asia in 2010. Now that you are aware of the delights of Palace on Wheels, get aboard the luxury train and experience a royal vacation in Rajasthan. Very Interesting Blog!! India is the beautiful place.